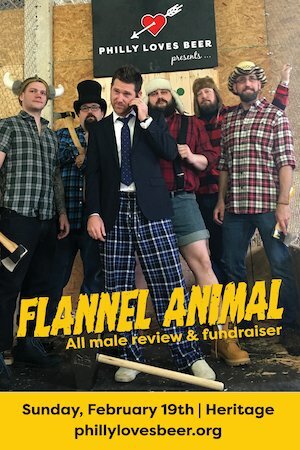 Tomorrow Sunday February 19th, Philly Loves Beer (PLB) will present Flannel Animal, a quirky all-male fashion show at Heritage in Northern Liberties, featuring the best and brightest gentlemen supporting Philly’s diverse beer community. This event is the PLB’s first fundraiser, with a suggested $5 donation for entry. PLB is a non-profit overseen by a community of like-minded beer professionals seeking to grow the pie and promote the whole Philadelphia region. Through a membership network, PLB works to promote and educate consumers about beer for 365 days a year, while celebrating Philly’s proud brewing culture by highlighting local brewers and progressive national trends. Doors open at 6 pm and the show at 8 pm, complete with music and a catwalk! Hosted by the lovely and always fashion-forward Fanci DisMount Stratton, Flannel Animal will showcase 14 local beer celebrities (all dressed in flannel) competing in a variety of fun and entertaining categories, including: Evening Wear, Formal Wear and Wild Card round. Judges will be an all-female panel including: Marisa Magnatta (WMMR), Kylie Flett (Punch Media), Carol Stoudt (Stoudt’s Brewing) and Terry Berch (London Grill). The top five contestants will advance to the Final Round, where they will be vying for the Grand Prize: Axe-Throwing Tournament for 6-12 people at Urban Axes, America’s first indoor competitive axe-throwing facility, located in East Kensington. Contestants will include: Casey Parker (Jose Pistola’s, Sancho Pistola’s), Rich Colli (Varga Bar, Butcher Bar), Mike Lubieski (Weyerbacher), Jonny Sherlock (The Industry), John Stemler (Free Will Brewing), Kevin French (Heritage), Michael Contreras (2SP Brewing), Eric Gillard (Levante Brewing), Garrett Williams (Evil Genius), Kris Hagen (Devil’s Den), Jesse Andreozzi (Silk City), Scott Rudich (Round Guys), Matt Guyer (Beer Yard) and Brandon Szeker (Philly Loves Beer). PLB is a year-round entity devoted to raising Philadelphia’s global profile as a destination city for beer tourism; and monetary donations are necessary to support ongoing programming, such as Opening Tap, Beer Madness, Philly Beer Week’s European Vacation, along with various industry nights, educational seminars and networking events, all designed to uphold Philly’s reputation as the Best Beer-Drinking City in America. PLB’s leadership team is comprised of dedicated beer insiders, including: tavern and bar owners, brewpubs and breweries, local brewers and homebrewers, restaurants and restaurateurs, hotel operators, real estate agents, litigators, marketing managers, brand ambassadors, wholesalers and distributors, along with hospitality professionals. Led by Executive Director Kristine Kennedy, the Board of Directors includes: William Reed, Casey Parker, Curt Decker, Andy Dickerson, Matt Satten, Sheila Ballen, Christina Dowd, Terrance Leach, Mike Scotese, Erin Wallace, Alex Bokulich, Adrienne Renzelli, Ed Friedland, Tom Kehoe, John Stemler, Aaron Peskin and Tim Patton.